power of positive thinking is instrumental in making life look more bright and positive, but it also helps in your daily life with better health, happiness, better relationships, and a satisfied outlook on life. Better life is not brought about by a few minutes of positive thoughts. The desire to be truly happy with life has to come from within yourselves. You need to make a commitment to yourself to change the way you think from within yourselves and then you can positively affect yourself, as well as those around you. Effective positive thinking does not come from simply repeating some words to yourself every once in a while for a few minutes. If you are prone to such behaviour, you will notice that shortly after, the doubts, uncertainty, and a more negative outlook quickly returns. You need to fully commit yourself to thinking positive all the time. Before starting anything visualize the positive outcome in your mind. Clearly identify what you want to see happen, you will be amazed at the results. Use only positive thinking, use words such as ‘can’, ‘will’, ‘possible’, ‘able’. 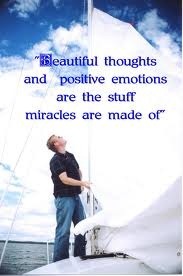 Allow this positivity to saturate your mind and allow yourself only to think successful and positive thoughts. You will also notice that positive outcomes are contagious and spread out over your environment. People will be impressed at your positive outlook and disposition. It can give you a huge boost to your relationships with family, friends, and co-workers. You’ll be surprised at how quickly you will gain the reputation of a positive aspiring person. In your conversations, use words that evoke happiness and success. Not only will you be reaffirming it to yourself, it will definitely come across to those around you. In turn, surround yourself with positive people. Try to minimize the time you spend around people who are constantly complaining or thinking negatively. Instead, try to help them find think positively and bring about a positive outlook on life. Try to curtail any complaining and negativity that spews out, instead, turn the conversation around into how the situation can be remedied and what could be a good plan of action that can bring about a positive and successful outcome.